Focus on these skills to take your grades (and life) to the next level. 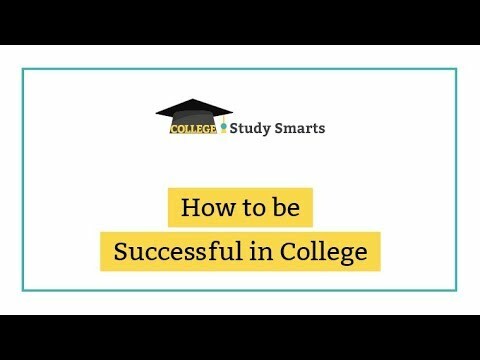 You will be surprised to learn how to be successful in college. I speak with a lot of students one-on-one about college success. We sometimes talk about content in courses I teach, but more often it is study strategies and mindset management. After only a few minutes of listening to a student talk about their studies, I can tell how easy it will be for them to be successful. In thinking of these three ingredients like a recipe, I want to consider proportion. In other words, do I need a Tablespoon of intelligence or a Cup of intelligence? It is a big difference, right? Some folks are going to disagree with me. That’s awesome. The world needs different opinions, and I’m going to explain mine. We are all born with a level of intelligence and can mold it within a small range of change. Intelligence, or your IQ, accounts for about five percent of your success in college. Where you fall on the IQ scale will mean some things are easier or more challenging than for the “average” student. I don’t put a lot of stock here because what does this even mean? Who is the average student, and how does it help me to compare myself to them? Answer: It is no help at all. I give intelligence a 5% factor in success because a higher intelligence level may mean some things are a little easier. Every student, regardless of intelligence level, is going to have challenging courses and challenging course content. Having a high IQ doesn’t mean you will automatically be successful. I don’t choose to spend any time concerned with my IQ level. You don’t get a say in it and you can’t change it. It does not determine how successful you will be in college. These are learned skills. Often we can learn and apply new strategies and see quick results. Most people think real change happens here. We think this is always the best area to focus on because it offers quick results. If you have never used a calendar and you commit to using one, it is going to rock your world. Try it! You will feel less stress immediately. There is immediate and real change through boosting our study skills and study strategies, but it isn’t the whole picture. I estimate 25% of success in college hinges upon having the right study skills. This is much like trying to eat a green smoothie every day to get healthy but still maintaining a steady diet of fast food. These strategies can have rapid results, but they are not the complete picture of how to be successful in college. No amount of quick tips can overcompensate for a lack of mindset or thought management. The majority of your success in college (and life) is determined by how you manage your thoughts. It’s a bold statement and you might not be sold yet—that’s OK. The first time this idea was presented to me I wasn’t sure I totally believed it. I have been chewing on this idea for years and look to see if it is proven in my life and those around me, and am completely sold. Understanding and managing my thoughts has enabled me to accomplish so many things. I see students with strong thoughts succeed and those without them fail. Don’t worry if you feel like you aren’t strong in this area—like study skills, we can learn to manage our thoughts. Unlike intelligence, you aren’t dependent upon a genetic lottery to determine your thoughts. You don’t have to rely on your boss, spouse, kids, co-workers, friends, or anyone else to decide your thoughts. You are the only one in charge. These are really big ideas. Really important ideas. The ideas we have about ourselves ultimately determine the actions we take. you’re not a great student. school is hard for you because ________. you’re a genius and school is easy. your life is too busy to balance school. studying is too hard for you. My recommendation for everyone is to take a peek inside your brain and see what is going on. Just pay attention to your thoughts. Good and bad, no judgment, just curiosity for the process. Try doing a thought download to help you get a sneak peek into your own mind. You will be surprised to see what’s going on behind the scenes. I’m going to do some generalization here to illustrate how important mindset is. Let’s talk about two types of students and how their mindset ultimately shapes how successful they each are in college. Charlie is stoked to be in college. He has been planning his enrollment for a while and is confident he will earn his degree in four years and then land an awesome job. He always completes his online coursework and turns everything in on time. Sometimes his grades are a little lower than he thought they would be. Yesterday he took an exam online and scored 75%. He’s bummed because he really studying for the exam and thought he was in great shape. Today Charlie sets up an appointment with his professor. He asks for feedback and advice on how to study for the next course exam. He picks up a couple of tips from his professor and starts working on the new strategies right away. Dale is in the same online course with Charlie. He’s not sure online courses are a good approach and questions if he should have gone to a traditional classroom. Charlie always turns in his assignments on time, but sometimes forgets to complete all of the coursework or gets so busy at work he doesn’t make time to finish. Yesterday Dale took the same exam and also got a 75%. He was really upset by his score and felt the questions were unfair and didn’t match up with what he studied. This exam has him questioning the online course again. He’s hoping the next exam will be fairer. You might have noticed Charlie has a positive outlook. He is confident in his abilities and proactive when there are setbacks. Charlie is on a great track in school and needs a few tweaks in his study strategies to get the results he wants. Dale is really stuck in his mindset. He’s not confident in his choice of school or his own abilities. Charlie is passing a lot of blame around to the school, course, and exam, but he isn’t considering a different approach. In fact, his mindset is preventing him from trying new study strategies. His next steps are to keep taking the same actions and hope the exam treats him better the next time around. Which student do you think is going to get an A on the next exam? If I could gift you with one superpower it would be the ability to identify and understand what is going on in your brain. Awareness of our thoughts is so powerful. If Dale realized his focus on what’s wrong with his school/course/exam wasn’t helping him prepare for the next exam, I bet he would do things differently. He probably doesn’t even know his thoughts are stuck in the blame game. Charlie may be more aware of his thoughts. Perhaps he even had a teacher, mentor, or parent in his life who taught him about his thoughts. A serious bonus for Charlie! We aren’t taught this while growing up. In fact, I was taught a lot about avoiding my own thoughts and feelings when they were uncomfortable. Since no one pulled me aside in high school to teach me about the impact of my thoughts, I’m stepping up today. Consider yourself pulled to the side by the lockers. When you understand what you are thinking and notice how they direct your actions, you are 75% closer to reaching our goals. Need an extra boost to get started? Sign up for the FREE 7-Day Study Challenge It covers both our thoughts and study skills to help you get a jump-start in learning how to be successful in college. I buy your book but I can’t access to it because of my localisation ( i live in Belgium). I sent you an email to help troubleshoot! Great post Jessica and I couldn’t agree more! Mindset has to do with everything in life, but often students don’t think it applies to learning, but it really does. I have seen a closed mindset block learning many times. Thanks for the great article! Thanks! I do think mindset affects everything in life and the impact of it shows up out most when we need courage…like when going back to school!